Apache Ambari には使いやすい Web UI と REST API が用意されているため、Apache Hadoop クラスターを簡単に管理および監視できます。Apache Ambari simplifies the management and monitoring of an Apache Hadoop cluster by providing an easy to use web UI and REST API. Linux ベースの HDInsight クラスターに含まれている Ambari は、クラスターの監視と構成の変更を行うために使用します。Ambari is included on Linux-based HDInsight clusters, and is used to monitor the cluster and make configuration changes. このドキュメントでは、HDInsight クラスターに含まれている Ambari Web UI を使用する方法について説明します。In this document, you learn how to use the Ambari Web UI with an HDInsight cluster. Apache Ambari とはWhat is Apache Ambari? 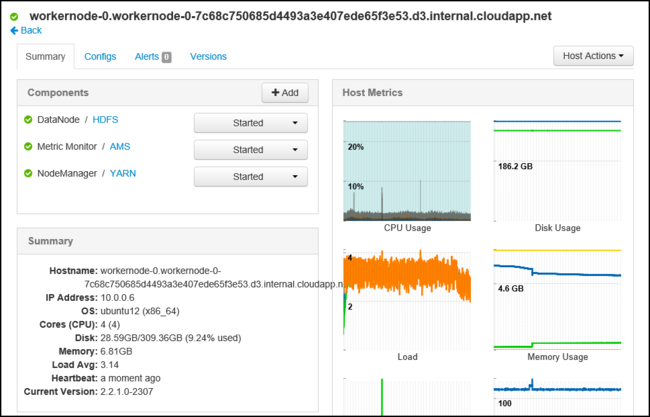 Apache Ambari は使いやすい Web UI を提供することにより、Hadoop の管理を簡略化します。Apache Ambari simplifies Hadoop management by providing an easy-to-use web UI. 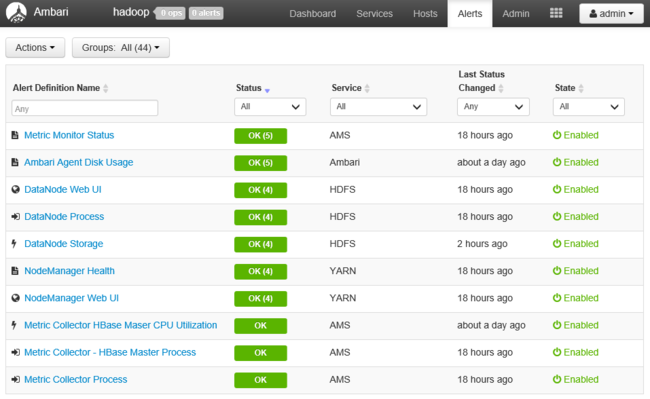 Ambari を使って、Hadoop クラスターを管理および監視できます。You can use Ambari to manage and monitor Hadoop clusters. 開発者は、 Ambari REST APIを使用して、これらの機能をアプリケーションに統合することができます。Developers can integrate these capabilities into their applications by using the Ambari REST APIs. Ambari Web UI は、Linux オペレーティング システムを使用する HDInsight クラスターに既定で付属しています。The Ambari Web UI is provided by default with HDInsight clusters that use the Linux operating system. Linux は、バージョン 3.4 以上の HDInsight で使用できる唯一のオペレーティング システムです。Linux is the only operating system used on HDInsight version 3.4 or greater. 詳細については、Windows での HDInsight の提供終了に関する記事を参照してください。For more information, see HDInsight retirement on Windows. Ambari Web UI はお使いの HDInsight クラスター (HTTPS://CLUSTERNAME.azurehdinsight.net) にあります。CLUSTERNAME はお使いのクラスターの名前になります。The Ambari Web UI is available on your HDInsight cluster at HTTPS://CLUSTERNAME.azurehdinsight.net, where CLUSTERNAME is the name of your cluster. HDInsight の Ambari に接続するには、HTTPS が必要です。Connecting to Ambari on HDInsight requires HTTPS. 認証情報の入力を求められたら、クラスターの作成時に提供された管理者アカウント名とパスワードを入力します。When prompted for authentication, use the admin account name and password you provided when the cluster was created. クラスター用の Ambari にはインターネットから直接アクセスできますが、Ambari Web UI の一部のリンク (JobTracker など) はインターネット上で公開されていません。While Ambari for your cluster is accessible directly over the Internet, some links from the Ambari Web UI (such as to the JobTracker) are not exposed on the internet. これらのサービスにアクセスするには、SSH トンネルを作成する必要があります。To access these services, you must create an SSH tunnel. 詳細については、HDInsight での SSH トンネリングの使用に関するページを参照してください。For more information, see Use SSH Tunneling with HDInsight. HDInsight では、Ambari Web UI の機能の一部がサポートされません。Not all features of the Ambari Web UI are supported on HDInsight. 詳しくは、このドキュメントの「サポートされていない操作」セクションをご覧ください。For more information, see the Unsupported operations section of this document. Ambari Web UI に接続すると、そのページに対する認証が求められます。When connecting to the Ambari Web UI, you are prompted to authenticate to the page. クラスターの作成時に利用したクラスター管理者ユーザー (既定では Admin) とパスワードを使用します。Use the cluster admin user (default Admin) and password you used during cluster creation. Ambari ロゴ - ダッシュボードを表示します。これを使用してクラスターを監視できます。Ambari logo - Opens the dashboard, which can be used to monitor the cluster. [クラスター名 # ops] - 進行中の Ambari 操作の数を表示します。Cluster name # ops - Displays the number of ongoing Ambari operations. クラスター名または [# ops] を選択すると、バックグラウンドでの操作の一覧が表示されます。Selecting the cluster name or # ops displays a list of background operations. 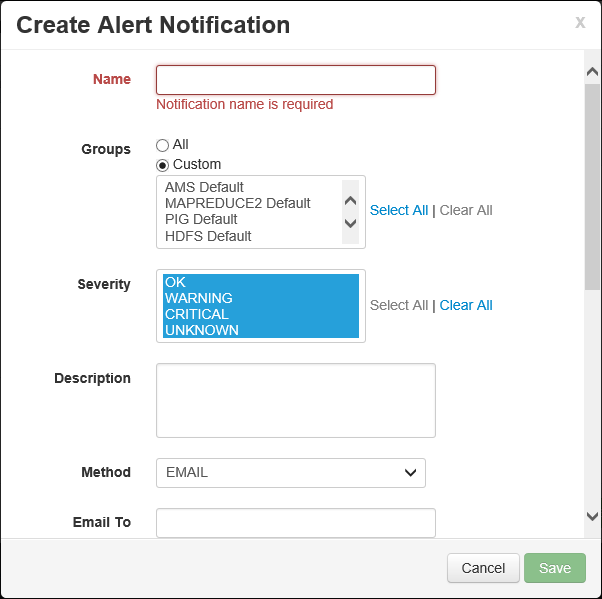 [# alerts] - クラスターの警告または重要なアラートの数 (ある場合) が表示されます。# alerts - Displays warnings or critical alerts, if any, for the cluster. [Dashboard] - ダッシュボードが表示されます。Dashboard - Displays the dashboard. [Services] - クラスターのサービスの情報と構成設定。Services - Information and configuration settings for the services in the cluster. [Hosts] - クラスター内のノードの情報と構成設定。Hosts - Information and configuration settings for the nodes in the cluster. [Alerts] - 情報、警告、重要なアラートのログ。Alerts - A log of information, warnings, and critical alerts. [Admin] - クラスターにインストールされたソフトウェア スタック/サービス、サービス アカウント情報、Kerberos セキュリティ。Admin - Software stack/services that are installed on the cluster, service account information, and Kerberos security. [admin] ボタン - Ambari の管理、ユーザー設定、ログアウトを行います。Admin button - Ambari management, user settings, and logout. [OK] 以外のアラートでは、アラート数を表示する [# alerts] エントリがページ上部に表示されます。Alerts other than OK cause the # alerts entry at the top of the page to display the number of alerts. このエントリを選択すると、アラートとそのステータスが表示されます。Selecting this entry displays the alerts and their status. アラートはいくつかの既定のグループにまとめられます。このグループは、[Alerts] ページで表示できます。Alerts are organized into several default groups, which can be viewed from the Alerts page. グループを管理するには、[Actions] メニューを使用して、[Manage Alert Groups] を選択します。You can manage the groups by using the Actions menu and selecting Manage Alert Groups. 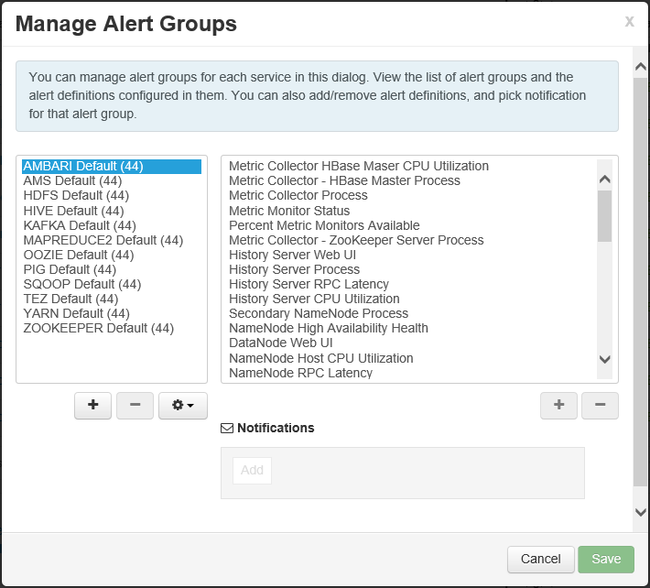 [Actions] メニューで、[Manage Alert Notifications ] を選択して、アラート方法を管理したり、アラート通知を作成したりすることもできます。You can also manage alerting methods, and create alert notifications from the Actions menu by selecting Manage Alert Notifications. 現在の通知が表示されます。Any current notifications are displayed. ここから通知を作成することもできます。You can also create notifications from here. 特定のアラート/重要度の組み合わせが発生したとき、通知は EMAIL または SNMP で送信されます。Notifications can be sent via EMAIL or SNMP when specific alert/severity combinations occur. たとえば、[YARN Default] グループのいずれかのアラートが [Critical] に設定されたときに電子メール メッセージを送信できます。For example, you can send an email message when any of the alerts in the YARN Default group is set to Critical. 最後に、[Actions] メニューの [Manage Alert Settings] を選択すると、通知の送信前にアラートが発生する回数を設定できます。Finally, selecting Manage Alert Settings from the Actions menu allows you to set the number of times an alert must occur before a notification is sent. この設定は、一時的なエラーの通知を防ぐために使用できます。This setting can be used to prevent notifications for transient errors. ダッシュボードの [Metrics] タブには、クラスターのステータスを一目で簡単に確認できる一連のウィジェットが用意されています。The Metrics tab of the dashboard contains a series of widgets that make it easy to monitor the status of your cluster at a glance. [CPU Usage] などのいくつかのウィジェットをクリックすると、追加の情報が表示されます。Several widgets, such as CPU Usage, provide additional information when clicked. [Heatmaps] タブには、緑から赤までの色分けによるメトリックが表示されます。The Heatmaps tab displays metrics as colored heatmaps, going from green to red. クラスター内のノードの詳細については、[Hosts] を選択します。For more information on the nodes within the cluster, select Hosts. 次に、関心のある特定のノードを選択します。Then select the specific node you are interested in. ダッシュボードの [Services] サイド バーでは、クラスターで実行中のサービスのステータスを視覚的に簡単に確認できます。The Services sidebar on the dashboard provides quick insight into the status of the services running on the cluster. ステータスまたは実行する必要があるアクションを示すために、さまざまなアイコンが使用されます。Various icons are used to indicate status or actions that should be taken. たとえば、サービスをリサイクルする必要がある場合は、黄色のリサイクル記号が表示されます。For example, a yellow recycle symbol is displayed if a service needs to be recycled. 表示されるサービスは、HDInsight クラスターの種類とバージョンによって異なります。The services displayed differ between HDInsight cluster types and versions. ここに表示されるサービスは、お使いのクラスターに表示されるサービスとは異なる場合があります。The services displayed here may be different than the services displayed for your cluster. サービスを選択すると、サービスの詳細が表示されます。Selecting a service displays more detailed information on the service. Job History - MapReduce ジョブ履歴Job History - MapReduce job history. Resource Manager - YARN リソース マネージャー UIResource Manager - YARN ResourceManager UI. 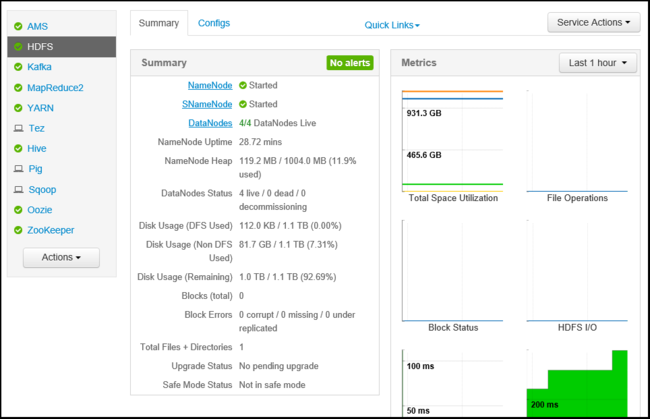 NameNode - Hadoop 分散ファイル システム (HDFS) NameNode UINameNode - Hadoop Distributed File System (HDFS) NameNode UI. Oozie Web UI - Oozie UIOozie Web UI - Oozie UI. これらのいずれかのリンクを選択すると、ブラウザーに新しいタブが開き、選択したページが表示されます。Selecting any of these links opens a new tab in your browser, which displays the selected page. ドメイン参加済み HDInsight クラスターを使用する場合は、ユーザー、グループ、アクセス許可の管理がサポートされています。Working with users, groups, and permissions are supported when using a domain joined HDInsight cluster. ドメイン参加済みクラスターでの Ambari 管理 UI の使用の詳細については、ドメイン参加済み HDInsight クラスターの管理に関する記事を参照してください。For information on using the Ambari Management UI on a domain-joined cluster, see Manage domain-joined HDInsight clusters. Linux ベースの HDInsight クラスターでは、Ambari ウォッチドッグ (hdinsightwatchdog) のパスワードは変更しないでください。Do not change the password of the Ambari watchdog (hdinsightwatchdog) on your Linux-based HDInsight cluster. パスワードを変更すると、スクリプト アクションを使用したり、クラスターでスケール操作を実行する能力が損なわれます。Changing the password breaks the ability to use script actions or perform scaling operations with your cluster. [Hosts] ページには、クラスター内のすべてのホストが一覧表示されます。The Hosts page lists all hosts in the cluster. ホストを管理するには、次の手順に従います。To manage hosts, follow these steps. ホストの追加、使用停止、および再任命は HDInsight クラスターでは使用しないことをお勧めします。Adding, decommissioning, and recommissioning a host should not be used with HDInsight clusters. 管理するホストを選択します。Select the host that you wish to manage. [Start all components] - ホスト上のすべてのコンポーネントを開始します。Start all components - Start all components on the host. [Stop all components] - ホスト上のすべてのコンポーネントを停止します。Stop all components - Stop all components on the host. [Restart all components] - ホスト上のすべてのコンポーネントを停止してから起動します。Restart all components - Stop and start all components on the host. [Turn on maintenance mode] - ホストのアラートを抑制します。Turn on maintenance mode - Suppresses alerts for the host. アラートを生成するアクションを実行している場合は、このモードを有効にする必要があります。This mode should be enabled if you are performing actions that generate alerts. たとえば、サービスの停止と開始です。For example, stopping and starting a service. [Turn off maintenance mode] - ホストを通常の警告に戻します。Turn off maintenance mode - Returns the host to normal alerting. [Stop] - ホスト上の DataNode または NodeManagers を停止します。Stop - Stops DataNode or NodeManagers on the host. [Start] - ホスト上の DataNode または NodeManagers を起動します。Start - Starts DataNode or NodeManagers on the host. 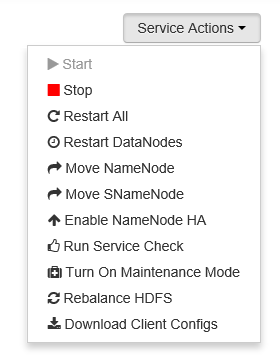 [Restart] - ホスト上の DataNode または NodeManagers を停止して起動します。Restart - Stops and starts DataNode or NodeManagers on the host. [Decommission] - クラスターからホストを削除します。Decommission - Removes a host from the cluster. HDInsight クラスターではこの操作は使用しないでください。Do not use this action on HDInsight clusters. [Recommission] - 使用停止にしたホストをクラスターに追加します。Recommission - Adds a previously decommissioned host to the cluster. [Dashboard] または [Services] ページでサービスの一覧の下部にある [Actions] ボタンを使用して、すべてのサービスを停止し、開始します。From the Dashboard or Services page, use the Actions button at the bottom of the list of services to stop and start all services. このメニューには [サービスの追加] が表示されますが、これを使用してサービスを HDInsight クラスターに追加しないでください。While Add Service is listed in this menu, it should not be used to add services to the HDInsight cluster. 新しいサービスは、クラスターのプロビジョニング中にスクリプト アクションを使用して追加する必要があります。New services should be added using a Script Action during cluster provisioning. スクリプト アクションの使用の詳細については、「 Script Action を使って HDInsight クラスターをカスタマイズする」を参照してください。For more information on using Script Actions, see Customize HDInsight clusters using Script Actions. [Dashboard] または [Services] ページでサービスを選択します。From the Dashboard or Services page, select a service. [Summary] タブの上部で [Service Actions] ボタンを使用して実行する操作を選択します。From the top of the Summary tab, use the Service Actions button and select the action to take. これにより、すべてのノードでサービスが再起動されます。This restarts the service on all nodes. クラスターの実行中にサービスを再起動すると、アラートが生成される場合があります。Restarting some services while the cluster is running may generate alerts. アラートを回避するには、[Service Actions] ボタンを使用して、再起動を実行する前に、サービスの [Maintenance mode] を有効にします。To avoid alerts, you can use the Service Actions button to enable Maintenance mode for the service before performing the restart. 操作を選択したら、ページ上部の [# op] エントリが増分され、バックグラウンド操作が実行されていることが示されます。Once an action has been selected, the # op entry at the top of the page increments to show that a background operation is occurring. バックグラウンド操作を表示するように設定されている場合は、バックグラウンド操作の一覧が表示されます。If configured to display, the list of background operations is displayed. サービスの [Maintenance mode] を有効にした場合は、操作が完了したら、[Service Actions] ボタンを使用してこれを忘れずに無効にしてください。If you enabled Maintenance mode for the service, remember to disable it by using the Service Actions button once the operation has finished. [Configs] タブをクリックします。現在の構成が表示されます。Select the Configs tab. The current configuration is displayed. 以前の構成の一覧も表示されます。A list of previous configurations is also displayed. 表示されたフィールドを使用して構成を変更し、 [Save] を選択します。Use the fields displayed to modify the configuration, and then select Save. または、以前の構成を選択し、 [Make current] を選択して以前の設定にロールバックします。Or select a previous configuration and then select Make current to roll back to the previous settings. Hive ビュー:Hive ビューを使用すると、Web ブラウザーから直接 Hive クエリを実行できます。Hive View: The Hive View allows you to run Hive queries directly from your web browser. クエリの保存、結果の表示、結果のクラスター ストレージへの保存、または結果のローカル システムへのダウンロードを行えます。You can save queries, view results, save results to the cluster storage, or download results to your local system. 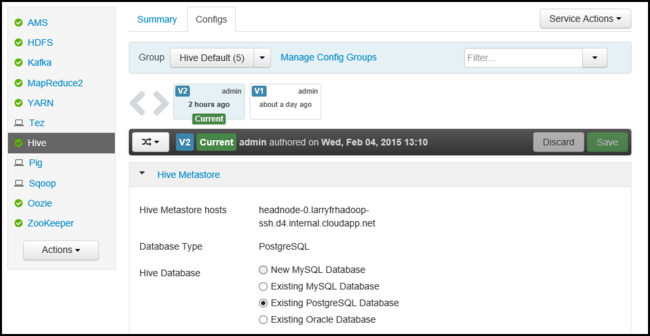 Hive ビューの使用法の詳細については、HDInsight での Apache Hive ビューの使用に関するページを参照してください。For more information on using Hive Views, see Use Apache Hive Views with HDInsight. Tez ビュー:Tez ビューによって、ジョブの理解が深まり、最適化を改善できます。Tez View: The Tez View allows you to better understand and optimize jobs. Tez ジョブがどのように実行されて、どのリソースが使用されているかに関する情報を見ることができます。You can view information on how Tez jobs are executed and what resources are used. メトリック コレクター サービスの移動。Moving the Metrics Collector service. メトリック コレクター サービスで情報を表示するとき、[Service Actions](サービス アクション) メニューで使うことができるアクションの 1 つに [Move Metrics collector](メトリック コレクターの移動) があります。When viewing information on the Metrics Collector service, one of the actions available from the Service Actions menu is Move Metrics collector. HDInsight では、このアクションはサポートされていません。This is not supported with HDInsight. HDInsight で Apache Ambari REST API を使う方法を学習します。Learn how to use the Apache Ambari REST API with HDInsight.